We are growing the greatest new squash this year. It’s called Zucchino Rampicante. This one is both a summer and winter squash. 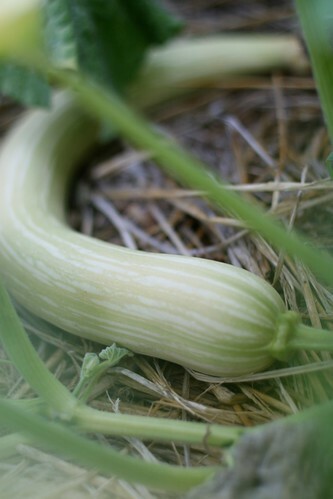 You can eat it now like a zucchini or you can let them get big and be a hard skinned winter squash. We obviously haven’t tried it as a winter squash yet, but as a summer squash it tastes a lot like butternut. We’ve had some in soup and it was a nice treat to have that flavor mixed among the others. As they are growing they are forming these large bulbs at the end like gourds are well over a foot long. 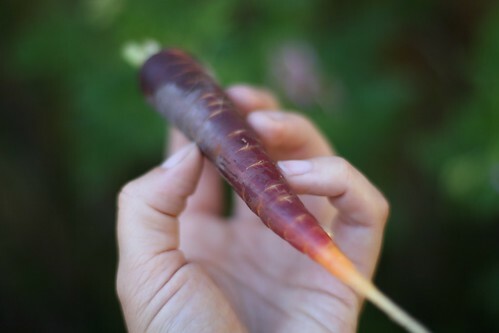 I can’t wait to see what they look like and taste like when fully mature. You should try this one next year! What new thing are you growing this year that you are excited about? 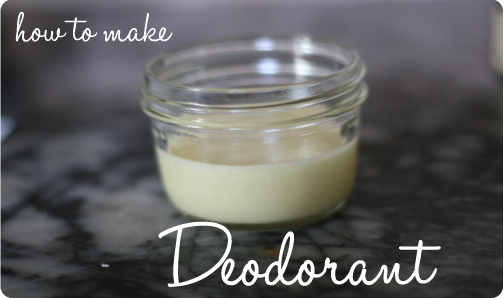 How to Make Homemade Deodorant – i love it! If you like this recipe, you’re going to love the booklet! Around the time that I took the dive into going without shampoo, I found not only the handmade hand lotion recipe but also a homemade deodorant recipe. I was immediately curious about the deodorant because the previous five or so months leading up to that I wasn’t wearing anything for a deodorant, which admittedly maybe was not a wise decision to make in the middle of summer. However, ever since Scott and I have known each other and gotten to that point in a new relationship where you get comfortable talking about such things as antiperspirant, he’s been trying to get me to stop using it. I was always an antipersperant user because I hated the feeling of being sweaty, but I did have to admit that all the correlations made between using that and getting breast cancer were worrisome. Of course it took me a good 7 years to head his warning, but I finally started testing out commercial deodorants that lacked the aluminum of antiperspirants. I tried all sorts from Burts Bees to Tom’s of Maine and some other lesser known brands and all of them made me sweatier feeling than if I wore nothing at all. It was the strangest thing! So last summer I decided to wear nothing at all under my arms and I noticed that I started to feel less sweatier (this is such a lovely topic to write about – yuck!) Anyway, being that it was summer and that I built a picket fence and we had plenty of 100+ degree days, I will be the first to admit that you probably wouldn’t have wanted to stand too close to me by the end of the day. Now, I’m all for smelling like the beautiful human being that you are, but there’s human scent and then there’s stinky scent. That was what I needed to eliminate. 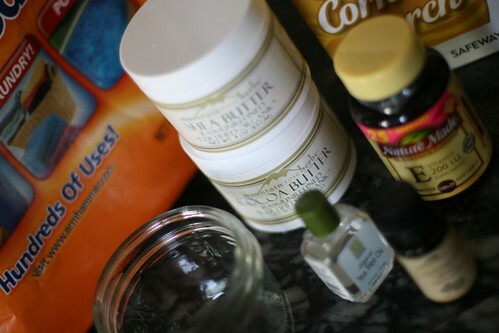 When Amy Karol wrote about her deodorant recipe, I had to try it. I already wanted to buy emulsifying wax from Mountain Rose and now I just needed to order two more things and I was set for making a whole line of homemade body care products. It was easy to make, although scraping out the butters was a bit of a job, but nothing to deter me. I have to say that I LOVE this deodorant and I encourage you to try it! I’ve been wearing it everyday since last November and I’m on my second batch. It doesn’t make me sweatier and I’m stink free all day long. It’s fairly cost effective, at just under $3 a batch, which lasted me about five months. 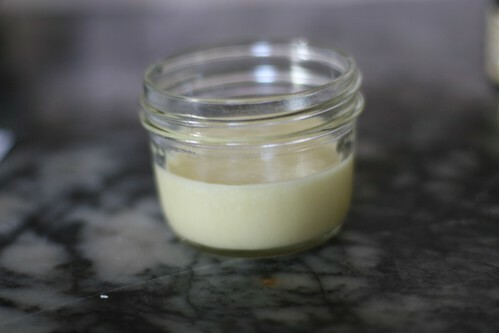 Here’s how to make the Homemade Deodorant: I’m going to list the ingredients and how to make it with pictures, but you should really click over to Amy’s Angry Chicken to read the exact recipe. Vitamin E tablets are expensive to buy, I think I paid around $11 for my jar, so if you want to pass on this ingredient I think you can. For the essential oils, I chose a combination of Tea Tree Oil which has antibacterial properties (and if there’s anywhere I don’t want bacteria, it’s under my arms!) and Lavender Oil because I had bought some to make the hand lotion. It turned out to be a really nice combination. 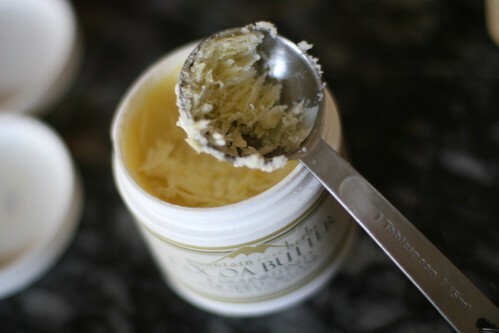 Also as I mentioned, the butters took some scraping to get out of their jars. I basically scraped and scraped and then packed them into the tablespoon measure until I had enough. 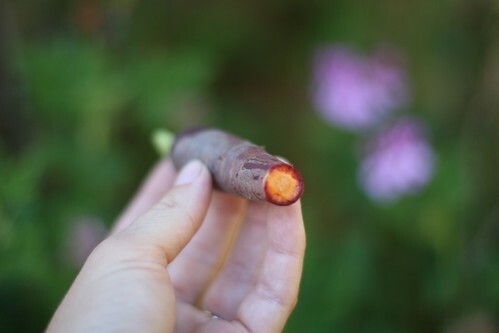 If you have the chance, make this in the summer when it’s much easier to scrap. This last batch was much easier to get out than the batch I made last November. Then you simply put all of the ingredients into a microwaveable Pyrex measuring cup (don’t put the Vitamin E Tablets or the Essential Oil though yet) and microwave it for about 30 seconds and then stir. 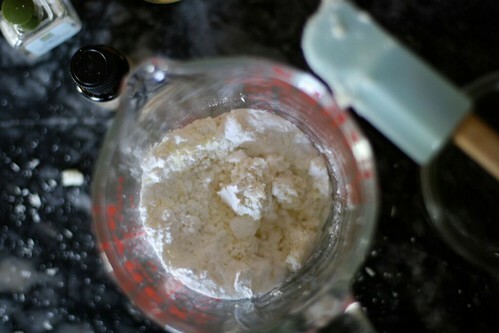 Then 30 seconds again and stir until it’s all melted and combined. At that point I added the Vitamin E and essential oils, poured it into the half pint jar and let it sit overnight. Now in the morning after my shower I scrape out a pea sized amount with the back of my thumbnail and smear on. It has a nice texture so I don’t mind using my hand to rub it in, then if I have extra left on my hand I just rub it into my hand like lotion, which it basically is, right? Mine kept on the bathroom counter for 5 months before I noticed that it wasn’t smelling as fresh as it used to. I only had a tiny bit left so I felt okay dumping that out and making another batch. Amy suggests making the recipe and pouring half into a container to use and keeping the other half in the fridge, which is a good idea. I found that I got three full recipes out of the shea butter container, which has a shelf life of a year. So you might want to consider making a batch for a loved one while you are at it. Also you’ll find yourself with some left over cocoa butter after making three batches of this, and I’ve found if you add a tablespoon to the lotion recipe it turns out divine! This homemade deodorant, paired with some handmade lotion along with some jars of whatever you’ve canned would make a fantastic, loving and frugal gift! If you are looking to make this as Christmas gifts, you might want to check out my new Christmas Labels too! What to Do with All the Fruit? Despite last weeks reported disappointments, we must be doing something right in other parts of our yard because it is becoming increasingly harder to find counter space in our kitchen. Is your kitchen counter the same each summer? We are truly at that point in zucchini season where you are ready to sneak over and pop a few into the neighbors mailbox and run for dear life. If I knew that our neighbors didn’t already grow plenty of zucchini I would have done so already. In fact our neighbor across the street was the one who inspired us to grow these Portofino zucchini’s which are our favorite by far. 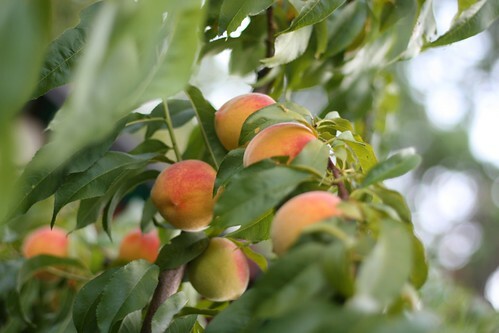 The peach and nectarine tree are ripe this week which means lots of canning, fruit roll ups and of course peach margaritas! Do you have any ideas for preserving fruit besides canning? Enough people have suggested dehydrating that I might just give that a try this year. We’ve tried freezing bags of cut up peaches, but besides using them in smoothies we haven’t found them to be a very useful. I’d love to hear more suggestions. UPDATE: Yesterday I made this fantastic peach galette that a former collegue created. It was fantastic! Give it a try. Thank you everyone for the tomato sympathy yesterday. I thought since we all enjoyed lamenting over our green tomatoes that I’d share another garden disappointment: our peppers. Usually we grow great peppers and by this time last year we even had some peppers on the plants, but this year… this year is a pepper disaster. 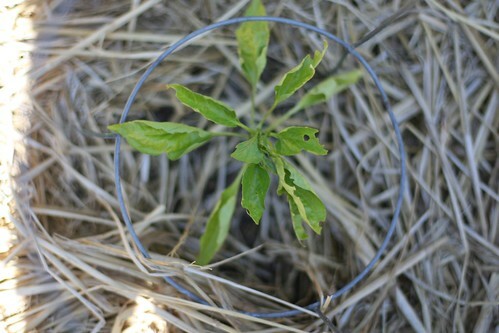 All of the peppers, be them red bell peppers or green, heirloom or hybrid, grown from seed or bought as seedlings are all looking extremely pathetic. We thought it might be just us so we went to the nursery to buy some new, lush green ones, but all of theres look the same as ours. A little yellow, a little shriveled and plain old little in size. Maybe this cool summer has created a bum year for peppers? How are your peppers doing? And did you see those melons in last years photo (link above)? Geez, ours are barely the size of golf balls now. A slow growing year, this year. It’s been a cool summer this year which has not been so beneficial to our garden. Not that I am complaining at all, we are not hot weather folks, but surely I can say that we would very much appreciate a ripe tomato. Just one big one for our first official BLT. 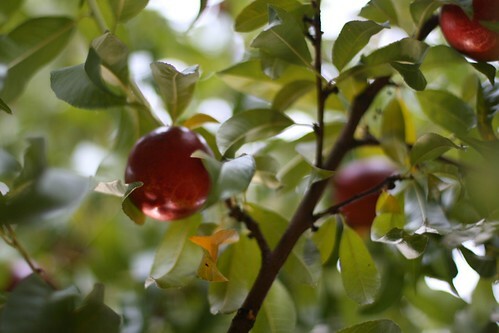 Or maybe a small cherry just to snack on during our mid garden walk. Something! 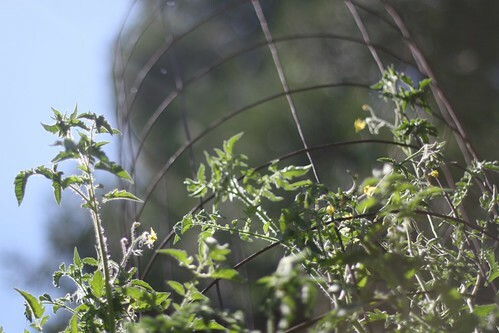 Our tomato plants are all doing well, towering over our heads in some cases and are full of tomatoes. But all of them are green without even a slight hint of red. Maybe these two days of heat will help. Hopefully. 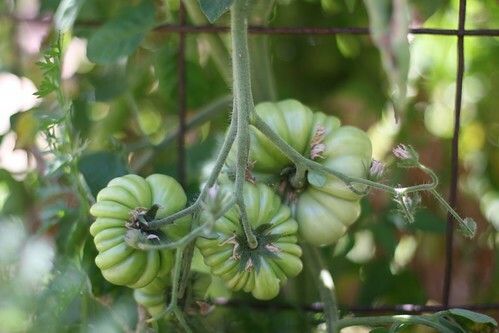 How are your tomatoes doing this year? I hear that if you are in New England things aren’t going so well. Oh sweet glory, the purple hazes are ready!